Coming to the "DISCOVERY CHANNEL". Baby George, his adoption, and those incredible sea-blue eyes. Some pictures of Nick and Artemis with baby George. To the left of the secod pew is the producer of the "Discovery Channel", Dave. 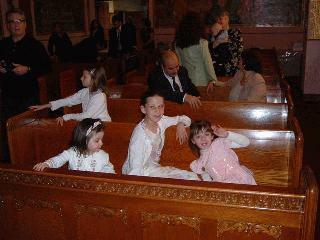 In the front pew, from left to right, Maria-Eleni Dimas, cousin Becca, and Jessica Dimas.